The Colosseum in Rome. What an incredible structure that was built by emperor Vespasian between 70 and 72 AD. It used to be covered in white marble. My question was how did it get in such disrepair? It's in the center of a thriving city. You would think they would have kept it in all it's splendor. I got my answer from the tour guide 'Georgio.' 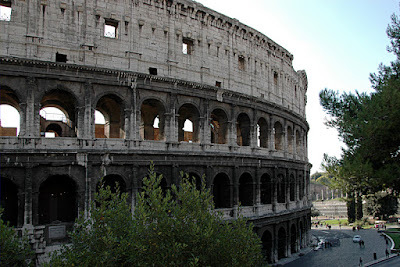 The Colosseum did well putting on shows of men fighting men, men fighting beasts, beasts fighting beasts, etc until around 500 AD when Romes economy went sour. Then the squatters moved in . They sold the white marble facade and turned it into a giant apartment building. An earthquake in 1349 caused the outer wall to collapse and the rest is history. I can only imagine it with the white marble and its silk roof . Please click picture for a better view. This was a panoramic shot that I used 5 separate photos to create. 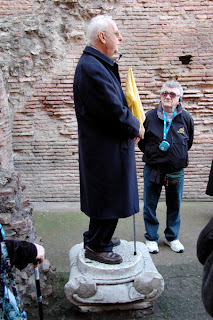 This was our guide Georgio. He kind of had a 'Ben Stein' thing going on. He was really good actually. He taught art history in college until he retired. Capri - what a beautiful island!